FlightLog : Because Five screens are better than Three! | Life, The Universe and ... Everything! FlightLog : Because Five screens are better than Three! I added two permanent displays below my monitors to form a "glass cockpit". At the bottom center is the Primary Flight Display (PFD) and Navigation Display (ND), running on a "naked" 12" LCD panel. I bought the panel as a spare part for an Asus 1215B laptop. It was the only one i could find on http://lelong.com.my that featured a LED backpanel (instead of a CFL one). It's using a LCD driver board (purchased on ebay.com) that lets it interface to the PC via HDMI. This is my second LCD driver board, after the first one exploded on me. 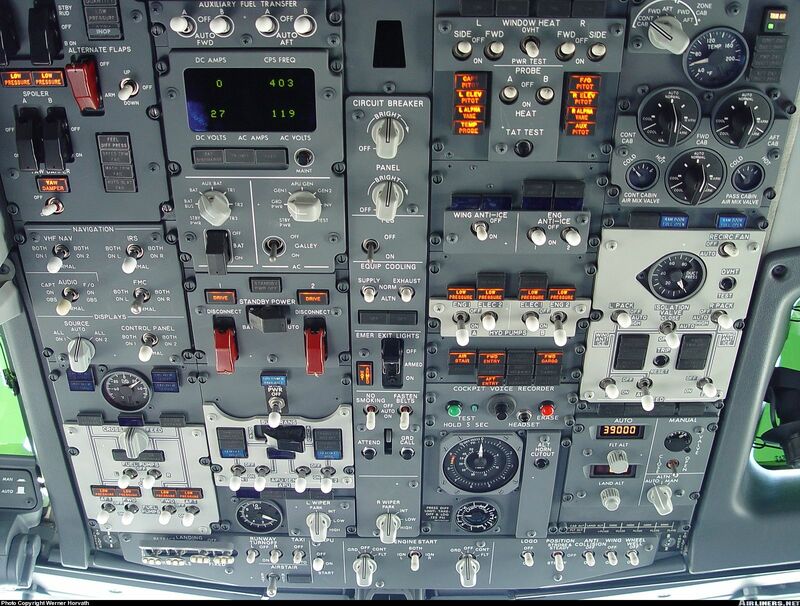 At the bottom right is the Engine-Indicating And Crew-Alerting System (EICAS) and Multifunction Display (MFD). It's running on a 13" Gechic On-Lap 1301 external display for laptops that I had from years ago. It has its own built-in VGA port and is USB powered. They're all mounted a modified IKEA shelf that sits on my desk. 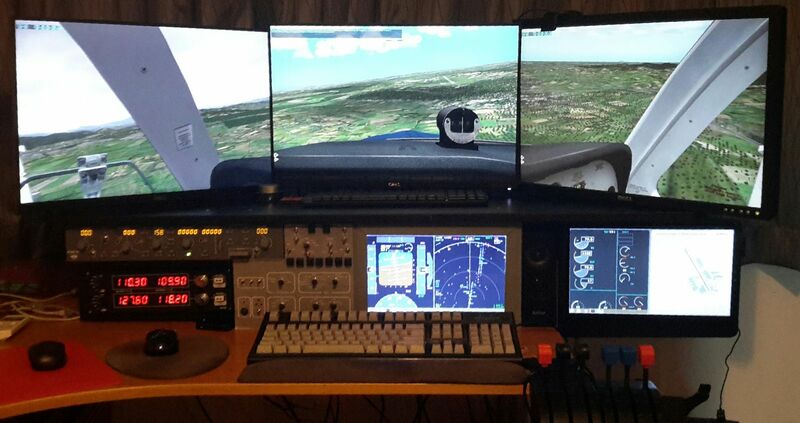 Both displays are driven using the XHSI software (http://xhsi.sourceforge.net/) which interfaces with the X-Plane flight sim software and renders the glass cockpit displays. The gray switch panel is a DIY project I'm working on. It's essentially a switch panel (similar to the EFIS panel on a 737) that lets me control the glass cockpit displays, such as selecting the visible layers on the ND, zoom level on the map, and display mode of the MFD. I've also added other switches to control internal cockpit lighting, autobrake, landing gear, parking brake, altimeter and decision height level. With this I can reduce the need to use the keyboard and mouse in the flight sim. Since I used this PC for my work as well, the panel is designed to fit into the constraints of a working desk, rather than mimic a real aircraft. The panel is connected to a Raspberry Pi to which I'm adding some electronics and writing software to interface the controls with the Flight Sim. On the bottom left is a Saitek Radio Panel -- I hate the look of it, and hope someday, once I figure out the electronics, to extend my switch panel and build my own radio panel. Above it is a GoFlight Pro replica of a 737 Master Control Panel (MCP) which I totally overspent on -- but it is gorgeous! I've got an interesting challenge lined up after I've completed the switch panel ... to build a complete, fully functional replica of the 737 Overhead Panel!